We have a somewhat unique VDP job that we need to produce. The catch is that we're in the process of debating whether to upgrade Fusion Pro (our old version is no longer compatible with Adobe CC) or to go with a program that we may negotiate a few licenses with if we go to purchase an additional press. At this exact moment in time, I've got a gentleman that can work wonders in Creative Suite. We also have a few people who have been using the light variable capabilities of Word for years now. We also have some people at Accuzip helping us out to try to prep the data file. Just an overview of the job. A local municipality is looking to send out a petition document to households in a defined area. Each letter is going to contain a sheet with all the names of every individual of voting age within the household in a format that is somewhat reminiscent of a spreadsheet. Some of these petitions will have 3 names. Some 2. Up to 5. The printing is the only thing that's causing me to scratch my head right now. Does anyone have any tips for creating an insert that is unique to each household, but also may have a unique number of entries on a per household basis? AccuZIP6 is capable of printing variable grid rows, based on household, so one sheet could print the designated 'primary' person in the address block, and then a list (grid) of one or many rows for the other household members of the voting age (if age is provided). Our support team should be able to assist you for sure. CONFIDENTIALITY NOTE: This email and any attachments are confidential and may be protected by legal privilege. If you are not the intended recipient, be aware that any disclosure, copying, distribution or use of this email or any attachments is prohibited under applicable law. If you have received this email in error, please notify us immediately by returning it to the sender and delete this message in its entirety from your computer. The sender does not accept any liabilities for errors, omissions, corruption or virus in the contents of this email or any attachments that may arise as a result of your receiving this email transmission. Even though your version of FP is not compatible with CC you could still work from a pdf file. I recently upgraded FP just for compatibility but there are no new features for the $799 price tag. FP can write a more efficient file for ripping than out of InDesign. I use both AccuZip and FusionPro but still do not totally understand what you are asking. How many variable data points (header records) are being merged? Are the additional household names in a separate column? There are many excellent tools for all kinds of variable data publishing. InDesign has a built in feature called Data Merge that easily takes in an ASCII text tab or comma delimited file (exported from spreadsheet or database). It enables the use of any and all of InDesign features - including things like variable length text flow and tables (which are Great inside of InDesign). Fusion Pro is a great tool, so is EM software's InData. A lot of the decision making will be dictated by the complexity of the project. If it is mainly text, Data Merge may do the trick. With complex imagery placement and variable text frames, something like InData will serve more efficiency. If the project is a long run - hundreds to thousands of pages - I'd suggest looking at a tool that acts as a Pre-Rip, in as much as it processes the variable data and simplifies the pages of the document(s). This can save A LOT of press idle time (especially IF any errors occur). Data integrity and cleanliness will be critical. Collect all images into a single directory/folder. Don't perform the merge across a network. Test a subset with the longest, most complex and shortest records. What if you could have a software robot to follow your directions exactly, building data-driven documents while you watch? 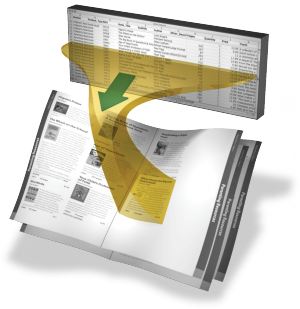 What if you could set up a template once, then flow in all your data for dozens or hundreds of pages, fully formatted and ready to print, with a single click?